I just love raw falafels. They taste just like real falafels without the ‘cooked’ part! Mine are currently in the dehydrator – so you will hear all about how good they taste tomorrow when I take them out! Process together the nuts, celery, carrots, garlic, onion until well combined. Add the remaining ingredients and process until a crumbly dough forms. The mixture should stick together when squeezed. If too dry add a Tbsp. water. On a lined dehydrator tray, place a scone or cookie dough cutter. 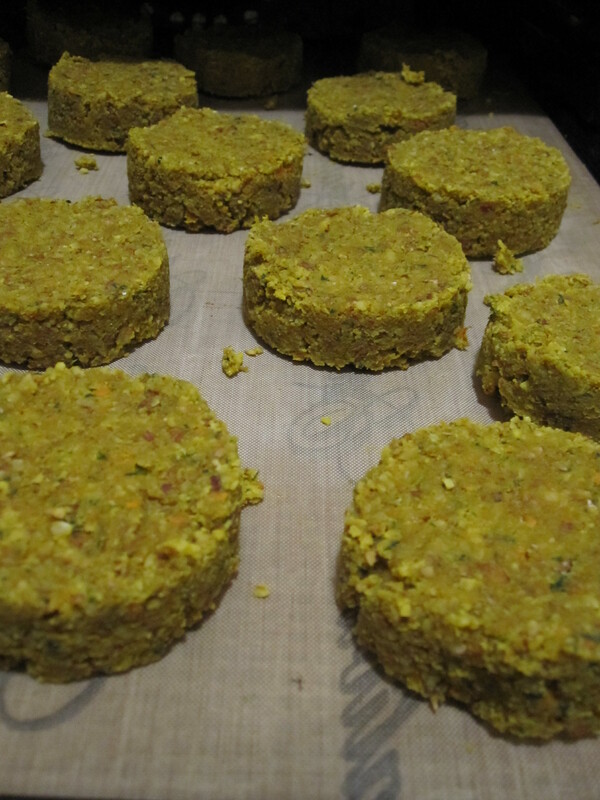 Press mixture into the cutter and then remove cutter leaving a round flat dough falafel. Continue this process with the remaining ingredients. Dehydrate for 10 hours – flip and remove teflex and dehydrate a further 2 hours.